Sometimes I enjoy exploring the unfamiliar store. Typically, I’m a mission shopper, especially when it comes to groceries. I have a list, organized by categories of food and other items in the order they’re placed in the store. I cruise up and down the aisles like a boss, grabbing what is on my list and avoiding everything else. I’ve avoided a lot of unnecessary purchases and wasted time because of my process. But I also miss out on discoveries. I miss out on what others experience when they walk into an unfamiliar place. Instead of helping others, I have to ask for help more often. I notice more details, more choices, more people. I was recently in a different town and decided to pick up my groceries (to save the time of an additional, out of the way stop at my regular store on the way home). I wasn’t concerned about time. I simply chose to enjoy the experience, try to get as much as I could on my list but also look around and see what other goodies I could discover. I learned I could buy a jack fruit for $40. I have no idea what I would do with it, but I’m sure it would feed a small army. I found a GuS (Grown-Up Soda)–in my favorite flavor, pomegranate–and sipped it all the way home. I appreciated some of the prices I normally pay (especially for pecans and walnuts) but was thankful for a wider selection of natural options. I walked up and down every single aisle. I’m not going to leave my routine shopping behind, but I need to leave my comfort zone more often. We all have routines that help us manage the to-do lists of our lives. But sometimes we need to let go of the to-do list long enough to appreciate the experience. It might be inconvenient and uncomfortable, but if we only stay in our comfort zones, we’ll miss out on a lot. Go to a different grocery store, coffee shop, church, or restaurant. Take a different route on your walk or run. Meet someone new. Engage in conversation that might make you squirm a bit but teaches you something in the process. 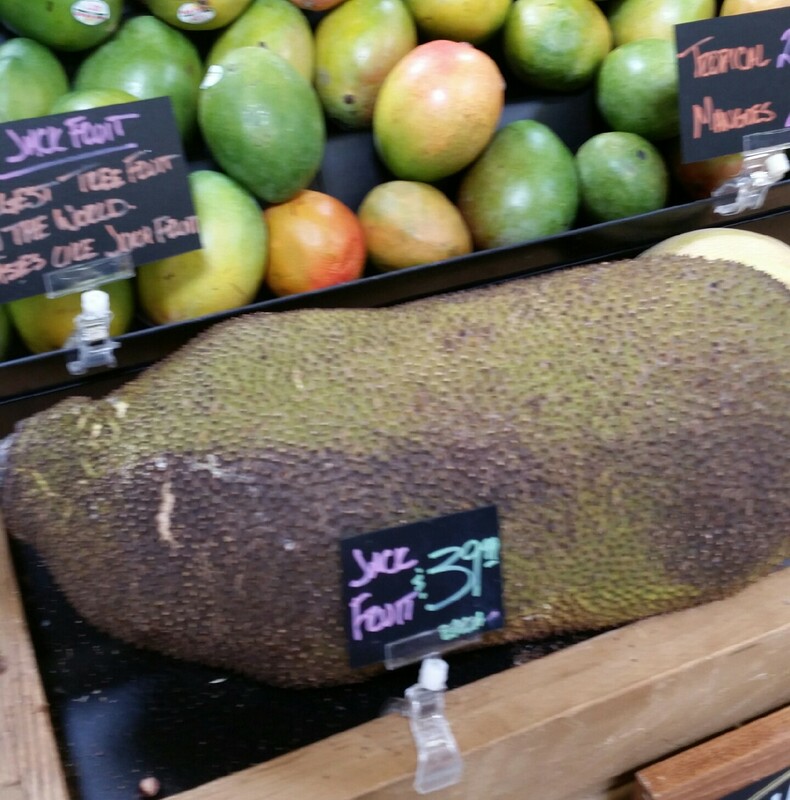 And if you find a need for a giant jack fruit, I know where to find one. Posted on September 1, 2015 August 17, 2015 by SusanHLawrencePosted in My Life with GodTagged adventure, change, discovery, grocery store, uncertainty, wandering. Next Next post: Are You Available to Help?